In a bowl, combine the chopped jalapeño and Fresno chili peppers, the cream cheese, onion, garlic, cumin and shredded cheeses. Stir until blended and season with salt and pepper. Spoon the filling into the hollowed-out chili peppers. Stir the panko and Parm together on a plate and roll the stuffed tops of the poppers in the panko-Parm mixture. Arrange the poppers on a baking sheet and coat with a little cooking spray. Roast until the chili peppers are tender-crisp and the filling is browned and bubbling, 15-18 minutes. Let stand for 10 minutes and serve. In Recipes-list.com we have selected the most viewed recipes from category - uncategorized . Enjoy the best recipes specially selected for you! 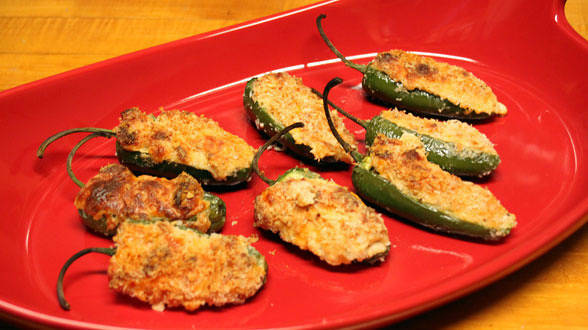 Jalapeño Poppers is the right choice that will satisfy all your claims.